The Starship. It’s been one of my favorite aircraft ever since I first saw it on the pages of Flying as a kid. The very name conjures up a sense of possibility and exploration, as though the very atmosphere would be unable to contain it. 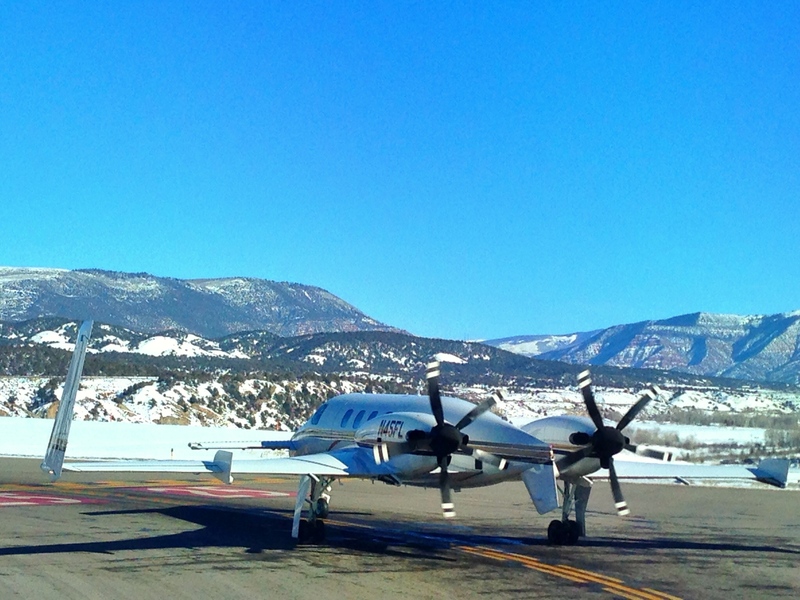 I happened upon one the other day as we taxied out to depart from Vail, Colorado in the Gulfstream. As is typical on a weekend day, the Eagle County Airport was abuzz with traffic, so we sat at the end of the runway cooling our heels while inbound aircraft made their approach. Nothing to do but admire the rare animal idling in front of us, those five-bladed McCauley props turning as the heat plumes flowed from the PT-6A-67 exhaust stacks. Delays are normally unwelcome. But when you’re sitting behind a Starship, it’s not so bad. It’s always a bit of a shock actually seeing one in the wild because Raytheon ceased supporting the airplane more than a decade ago, even going so far as to buy back and retire as many of the remaining airframes as they possibly could in exchange deals for new Premier jets. I wrote about the Starship a decade ago and compared it with the Concorde as the latter was being retired. I suppose it’s apropos to ponder the futuristic-yet-retired Beech creation now that Beechcraft itself is being absorbed by Textron. The Starship was every bit as futuristic as the Concorde. Developed in the early 1980′s, it was designed to replace the most successful business turboprop in history, the King Air. Starship was revolutionary because it the airframe was made of composites like carbon fiber. Composites are lighter and stronger than aluminum, but they are more complex to manufacture and they haven’t been around that long. Consequently, the FAA was very conservative and required a lot of extra testing and data for certification. It was also difficult and very labor intensive to manufacture, and many of Raytheon’s subcontractors missed critical deadlines. Raytheon itself experienced many delays as it learned to work with resins, adhesives, sealants, and other composite materials. Eventually the bugs were worked out, but the damage had been done. Only 53 Starships were built. And of those, only a small handful were ever sold. Most have remained in Raytheon’s inventory for more than a decade and have been used to supply replacement parts for the existing fleet. Starship was also one of the very first airplanes to be designed and built using a computer system. Called CATIA, this same system was used to create the Boeing 777. The storied Beech name reaches back more than eighty years. The company developed and built some of the longest-lived products in the history of aviation. Although they’re only built sparingly these days, Bonanzas have been manufactured since 1947, and the relatively young King Air line began in 1964 — a paltry half-century ago. Despite the firm’s financial difficulties, Beech at least makes something tangible. Beyond the cache and history of the Beechcraft name, it has facilities, production lines, patents, type certificates, intellectual property, and a comparatively skilled work force. To me, it simple generates far more excitement than, say, the high-flying Twitter, which has a market cap of $35 billion but has never turned a profit or built anything that makes the pulse race the way an aircraft can. When I was growing up, Beech/Raytheon represented some of the most exciting and cutting-edge stuff in the world of flying. I suppose that’s what I was truly reminded of when we found ourselves holding behind this beauty. It also occurred to me that the jet I was flying — a Gulfstream IV — celebrated its maiden flight only a few months before the Starship. How different their fates have been! The G-IV was wildly successful and is still in production while the promising composite turboprop never really got off the ground. It’s worth noting that a similar business aircraft, the Piaggio Avanti, also made its first flight in the mid-1980s and is still being built. And why not? It achieves nearly 400 knots at a 40% fuel savings over comparable jets. It must be painful for those who worked on the Starship project to know that airplanes like the Waco YMF-5 and Great Lakes biplanes — 1920’s tube-and-fabric technology — are still being built and sold while the sleek, modern ship they labored over is more or less relegated to photographs and museums. Aviation: it’s a strange business. It’s a neat aircraft in all senses. I always wondered how they serviced those guys. It’s an amazing machine. Very cool. Do you mean “serviced” as in keeping them airworthy without factory support? Robert Scherer, a Starship owner, bought the remaining fleet and part supply from Raytheon when they shut down the program, and as far as I know is still providing support to the remaining fleet. He used to be based at SNA, actually. His Starship was parked over at the Martin Aviation on the west side. Without his efforts, there probably wouldn’t be ANY Startships left in airworthy condition. Ron… thank you for the wonderful memory this post conjured up. My Dad and I flew to Portland so he could fly a Starship, for a pilot report in Western Flyer (known as General Aviation News today). As a young teenager, I happily tagged along. After the pilot and Dad ran the Starship through its paces, he tapped me on the shoulder and said, “You wanna fly it?” Are you kidding me? I couldn’t get into the cockpit fast enough. It was only about 10-minutes and a few s-turns at 17,500’… but it was 10-minutes and a few s-turns in a STARSHIP. Wow, you’ve logged time in a Starship? Lucky! I would imagine you’ve got a long list of cool stories from those days. This picture of the Starship mockup always looked like something out of a Star Trek episode. Still does, actually. Thanks for sharing the memory of your Starship experience. As long as there are airworthy examples still flying, I’ll keep the hope alive that perhaps I’ll have the same opportunity. Right, I was wondering how they serviced all those Starships considering they pulled out of the market with them. But I am wondering if it would make good business sense to have them on the line again. I see that you mentioned that the Piaggio is cost efficient and still in production, so why not the starship? The R and D is already complete, and its not 1980 anymore so the technology is there, could it be resurrected? Or has the market turned and there is no need for the aircraft type anymore. I understand there is a connection between Beech and Raytheon and you mentioned that Beech is being bought out by Textron, isn’t that the same parent company as Cessna? Anyway, its certainly an aircraft worthy of its name. I have seen a starship and been fortunate enough to watch one take off at KSNA, so that make sense they have one based there. Thanks for that! While it would certainly be possible to put the Starship back into production, sad to say it probably would not make sense from a purely financial perspective. Of course, half the stuff that goes on in aviation doesn’t make good business sense — we just do it because we love it, so “never say never”… but I’m not sure the problematic issues with the airplane could be fixed without spending a tremendous pile of money. As cool as the Starship looks, the final product was heavier than anticipated and took a long time to bring to market. As you know, weight is the enemy of performance. 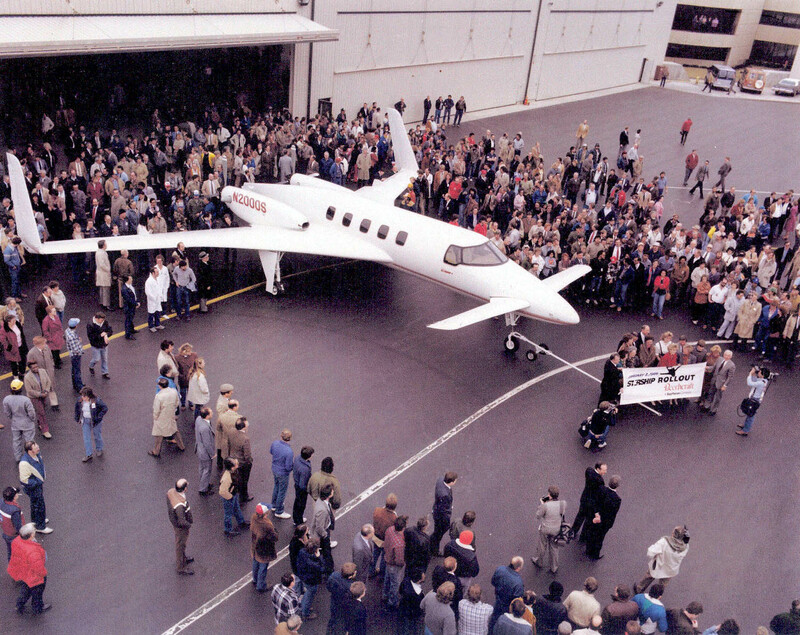 It was the first composite business aircraft, so that probably had people waiting on the sidelines, too. Worst of all, it came to market during a major downturn in the aviation sector. If you want to learn more about them, I recommend this page, and specifically this history document of the Starship program. I live and fly in Arizona and often fly into Marana airfield (KAVQ I believe) where 7 or 8 are stored on the ramp. They are beautiful airplanes indeed! They’re still there? That’s great to hear. I thought they’d all been dismantled or destroyed by now. Hopefully they can at least be parted out to support the remaining five that still fly! I’d like to add that I flew out of Scottsdale (KSDL) on Jan, 20, 2014 and there was a Starship on the flighline outside Sawyer Aviation, looking in fabulous condition. That plane makes everything else look so ordinary. I’d love a chance to fly one someday. Had the opportunity to do a story on the Starship in Addison, TX. Beautiful aircraft. Great little vignette on the Starship. I too got caught up in all the glamour of the Starship back in the day. It’s too bad they are a dying breed, but their legacy lives on in many other airplanes that enjoy the technologies that she ushered in. I would love to own a canard, just because they are cool. I have lusted many times over ads on Barnstormers.com of the progenitors like the Varieze and Longeze. Oh so little money and so little time. Thanks Brent. I think everyone who had their eye on aviation in the 1980’s has a bit of a soft spot in their heart for the clean, efficient curves and beauty of Rutan’s distinctive designs. They’re unmistakable when you see ’em. Even if you weren’t the composite type, the accomplishments of aircraft like Voyager has to be admired. In many ways Starship was the pinnacle of that line, and his only design which was put through the wringer of transport-category certification and production; maybe that’s why it’s such a shame that it failed in the marketplace. I was at Raytheon Aircraft (Beech) during the last days of the Starship. As mentioned above the Starship was heavy and too slow. I asked an OEM engine supplier why they did not just replace the 1,000 shp engines with bigger engines to let the Strarship achieve the advertised cruise speeds. His reply was that the Starship did not scale up well from Rutan’s prototype, and there was too much drag to let the Starship go any faster no matter how much horsepower was added. It was still one cool looking aircraft and turned heads everywhere it traveled, but it was too slow. Thanks for the insider view, Charles. It may have been slow to some people, but to the average King Air or turboprop owner of the day, it probably seemed quite speedy. How strange that the aircraft was described as being high drag! It doesn’t look like there’s much drag on it. No rivet heads, seams between skins, hard angles, etc. Weight on the other hand… whether you’re talking about people or airplanes, excessive weight is always a serious problem. I recall Rutan saying during the Voyager project that for each pound of weight they saved off the airplane, they could drop EIGHT pounds of fuel. Weight has always been a fanatical item for Burt Rutan; it makes me wonder what he thought of the final Starship product. I’m guessing he figured out it wasn’t going to work long before anyone else did. On the other hand, this article mentions an plan to remove weight from the Starship and put it back into production. What I was told was that it was the airfoil in addition to the weight that created the drag penalty. I did not get this info from Raytheon design but from an OEM with a 1,500 shp engine. Therein may lie the tale. Cessna definitely knows how to build aircraft. I’m sure the “Slowtation” moniker was burning in the back of their minds during that year in the tunnel. The only Citation I’ve flown was the Mustang, but it was brilliantly engineered for the mission of simple single-pilot operation. When they decide to do something, they really attack it. Even on the light single end of things, you can see it the intelligence. Okay, the Skycatcher was not a winner. But they bought the TTx instead of designing from scratch — very smart. The same is true of the Beechcraft purchase. Why reinvent the wheel when you can simply acquire the line which already owns the majority of the multi-turboprop market? I own a Piaggio P-180 which resembles the Starship. It uses the same engines as the King Air 200 and burns the same fuel, 100gph total, yet achieves 405 knots and will fly at 41,000 ft. I am told the secret is in the design of the fuselage which provides 20% of the lift. The cabin is stand up for the average person and 6ft1in wide with an aft potty. Very comfortable and easy on the pocketbook. The Avanti is one of the coolest looking airplanes in the air, and it definitely has the performance to back up the claims. One might think it was a descendant of the Starship, but the two made their maiden flights at almost the same time. You’d think with specs like that, the Avanti would absolutely crush the King Air line… yet Beech continues to sell quite a number of them. Very interesting article. Like you, I have always loved the sleek lines of the Starship. Good to know you are doing well and flying G IV’s. Stop by CPS and say hi to us some time. Greg! What a pleasant surprise to see your name my friend. You always had good taste in aircraft. 🙂 I will stop by CPS and see what the REAL pilots are up to! I worked with Beech’s ad agency back in the ’80s when the changes to the company and product line occurred. Everyone was excited about the revolutionary direction of the Starship design, but worried that Beech was committing a product-development sin. They were introducing and marketing a product that was going to compete against a product of theirs that was successful and still selling well: the KingAir. At the time their big concern was how Cessna was successfully selling Citations against KingAirs (i.e. why buy a turboprop when you can have a jet for identical costs?) Nothing bit into Beech’s turboprop options more than the Citation. Had they decided to put fan jets instead of turboprops on the Starship, I think they would have had more success because the preference for the KingAir was still very strong. It’s interesting that Beech was concerned about the Citation. The two airplanes are so different. Even if the acquisition cost was identical, the King Air offered a roomier cabin, superior short/rough field capability, reduced insurance requirements (especially for SP operation), lower maintenance cost, and on a typical leg didn’t arrive all that much later than the jet. You can see the acquisition cost equivalency in many areas. For $4 million you can get a new Pilatus PC-12 or a used Gulfstream IV. It’s almost a silly metric. A fanjet powered Starship… now that would have been an interesting aircraft. The points you make about the KingAir’s differences were what we marketed for Beech–extensively. But at the time their wasn’t really any significant turboprop competition. The Cessna Conquest never panned out, and the Cheyenne was going away. But Cessna was waging a successful campaign of jet vs propeller; a jet was sexier and had better resale value, or so they said. I believe that the Citation had earned a SP waiver as well. In the end, the Citation line became diverse and was hugely successful for Cessna, while the KingAir basically stayed “reliable” in sales demand. A jet-version Starship would have given Beech its first entry-level jet. Instead Raytheon opted for the Mitsubishi jet and later the HS-125 to build under contract. Part of me suspects the Starship was a front for Raytheon to become a leader in large composite assemblies. What was neat was to go to Wichita and see the huge airframe/wing molds, the layup-weaving process for the fuselage, and the giant auto-clave in action. Totally Star Trek to me. I just had a nice tour of the Acme Aircraft storage hangar at Greeley CO(once the J.W. Duff’s outfit). In the back amongst the stack of props was set aside on a pallet, a gorgeous 5 bladed prop, looked brand new, said to be from a Starship. Too nice to be a wall hangar…. I bet MotoArt could make something pretty cool out of that! Perhaps it’s on a separate pallet because there are still five or six Starships flying, so any airworthy parts might be worth a pretty penny. I was at Marana in Jun-2011 and they were glistening in the sun on the far side of the field.